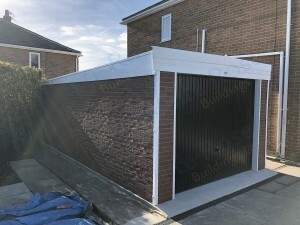 Brick effect sectional garages are increasing in popularity as the quality of the cladding increases substantially. On this project we laid a new base for the customer incorporating a ramp to the front with a drainage channel to protect the new garage from potential water ingress. 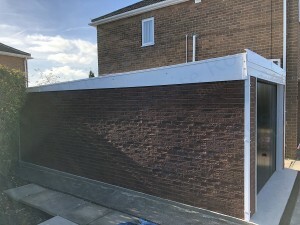 Our customer selected our brick effect cladding to all 4 sides to give the appearance of a brick built garage. 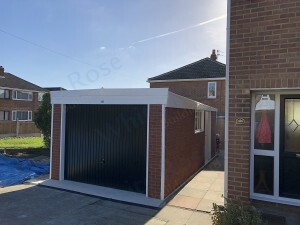 They chose the popular Knight Royale model with a Black Hormann up and over door to further compliment their house. The garage also had maintenance free PVCu fascias, a white Hormann personnel door with 3 point security locking, a double glazed PVCu Window and guttering to the rear.